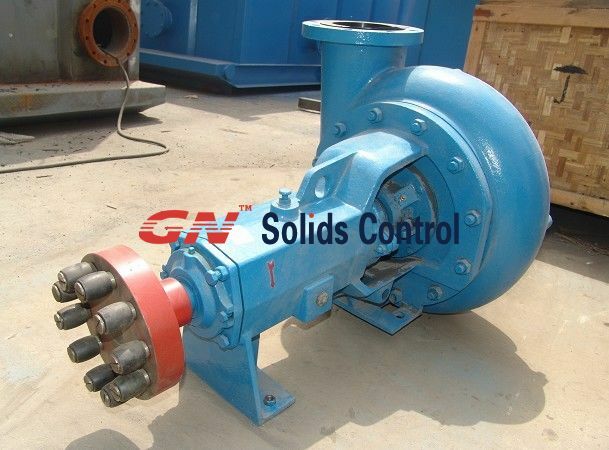 Centrifugal pump with mechanical seal some are required by GN Solids Control Clients for drilling mud System.As a manufacturer for mechanical seal centrifugal pump we give explanation info. as below. A centrifugal pump is a roto dynamic pump that uses a rotating impeller to increase the pressure of a fluid. Centrifugal pumps are commonly used to move liquids through a piping system. The fluid enters the pump impeller along or near to the rotating axis and is accelerated by the impeller, flowing radially outward into a diffuser or volute chamber (casing), from where it exits into the downstream piping system. Centrifugal pumps are used for large discharge through smaller heads. In some situations, packing material is not adequate for sealing a centrifugal pumps shaft. One common alternative method for sealing the shaft is with mechanical seals. Mechanical seals consist of two basic parts, a rotating element attached to the pump shaft and a stationary element attached to the pump casing. Each of these elements has a highly polished sealing surface. The polished faces of the rotating and stationary elements come into contact with each other to form a seal that prevents leakage along the shaft. The most effective method of preventing the leakage of the drilling fluids from the centrifugal pump to the external surroundings is using the mechanical seals. The mechanical seals help sealing the rotating part of the shaft against the stationary part of the pump housing. Let us see more details. What are Mechanical Seals in Centrifugal Pumps ? In the centrifugal pumps the rotor, on which the impeller is mounted, revolves in the stationary housing of the pump and there is minor gap between the two. The centrifugal pump pumps a variety of fluids and sometimes these fluids can be highly hazardous to the humans and also the environment. The most effective method of preventing the leakage of the fluid from the centrifugal pump to the external surroundings is using the mechanical seals. The mechanical seals help sealing the rotating part of the shaft against the stationary part of the pump housing. Thus the mechanical seals are the devices that form the packing between the rotor and the stationary part of the centrifugal pumps to prevent the leakage of the fluid being pumped by the pump. There are two main parts of the mechanical seals: one is the stationary part, which is connected to the pump housing and the other is the rotating part which is connected to the rotating shaft. Prior to the mechanical seals, the compression packing like gland packing were used as the sealants though they are still being used in number of applications. The mechanical seals are especially used in the process applications where the centrifugal pumps handle hazardous chemicals like HCL, sulfuric acid, etc. to meet the safety and the environmental standards as per the federal regulations. GN Specialize in solids control equipments manufacture,we have exported mechanical seal centrifugal pump for feeding desander,desilter. to over 20 countries around the world. Contact GN to Get right model Mechanical seal centrifugal pump from manufacturer.